Founded in 1902, St Stephen’s is a congregation of the Episcopal Diocese of West Virginia. The Episcopal tradition focuses upon the importance of faith practiced in community; on worship and service together. Our faith is centered on Christ, grounded in the Holy Scriptures and expressed through the liturgies of the Book of Common Prayer. We invite you to join us as we come together in Christ’s name to deepen our commitment to God and to one another. Our Mission: St Stephen’s Episcopal Church seeks to share and spread Christ’s love with the greater Beckley area and beyond through active worship, lively fellowship and service to others. St. Stephen’s became an organized mission in 1902 with only 14 communicants. Until 1916, St. Stephen’s depended on the Baptists, Methodists and Presbyterians for a place to worship. In 1916, members purchased the Methodist Episcopal Church on the corner of Heber and Earwood streets. The first resident priest for the church was the Rev. Ilbert Brayshaw, who never conducted a service because of a flu epidemic that banned all public meetings. He left Feb. 1, 1919. The Rev. Wilson P. Chrisman, a former Archdeacon of West Virginia, served as vicar from June 1, 1926, through his death March 21, 1935. It was during his time that membership grew to 132 and a new church building was constructed on Woodlawn Ave.
On May 11, 1938, St. Stephen’s became a self-supporting parish and called the church’s first rector, the Rev. C. William Sydnor. Under the leadership of the Rev. O. 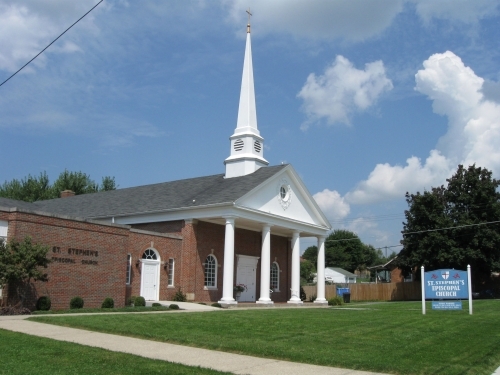 Worth May, the land where the current church building stands was purchased in 1949 and services began there on Palm Sunday in 1952. The Day School opened in 1956. From 1961 through 1970, the Rev. Joseph Rickards served as rector. The Rev. David Jones served as rector from 1972 through 1976. Jones, now retired, would later serve 17 years as a Bishop in the Diocese of Virginia. St. Stephen’s remained the only Episcopal Church in Raleigh County until 1977 when the church gave birth to a second Episcopal Church, All Soul’s in Daniels. All Soul’s has since closed and St. Stephen’s is once again the only Episcopal Church in the county. The Rev. Howard G. Backus served as rector from 1978 through 1990. In 1984, the columbarium and memorial gardens was constructed. Renovations in the 1980’s included making the church handicap accessible with ramps and an elevator. The Rev. Bill Bozeman served as rector from 1991 through 2002. The Rev. Eric L. Miller served as rector from 2005 through 2010. The Rev. Jon M. White was called to serve as the parish’s new spiritual leader in July 2012. The Rev. Susan Q. Claytor was called to be rector beginning March 3, 2019.